On May 20th 2018, Team Kagayama rider Yukio Kagayama was victorious at the Taste of Tsukuba Satsuki stage. The Katana racer machine has been produced by the team themselves. The spec is an old-meets-new hybrid equipped with a Katana base steel frame and GSX-R1000 L5 engine. 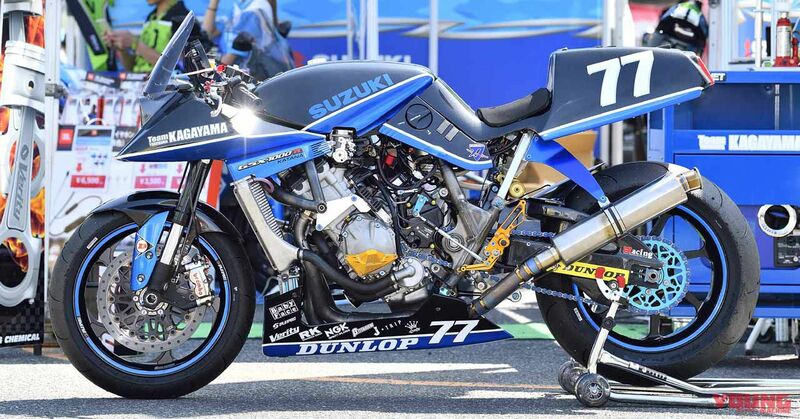 One of the top teams in Japan, Team Kagayama and its rider Yukio Kagayama that compete with a Suzuki GSX-R1000, has entered the biggest “grass race” (Amateur racing series) in Japan. As you can see the machine is a Katana racer, and it has taken part in the the highest ranking of the Taste series, the D.O.B.A.R. Hercules class. The main rules in this class merely stipulate the use of a steel frame and a T.O.T (Taste of Tsukuba) kind of form, so this bike is totally eligible. The Team Kagayama Katana racer is based on the original frame of the GSX1100S Katana, and the exterior also retains a true Katana form. In the Hercules class many of the bikes are completely original frames, but the upper section of the frame on this racer is from the pioneer Katana, so it protects the lineage of classic racing. 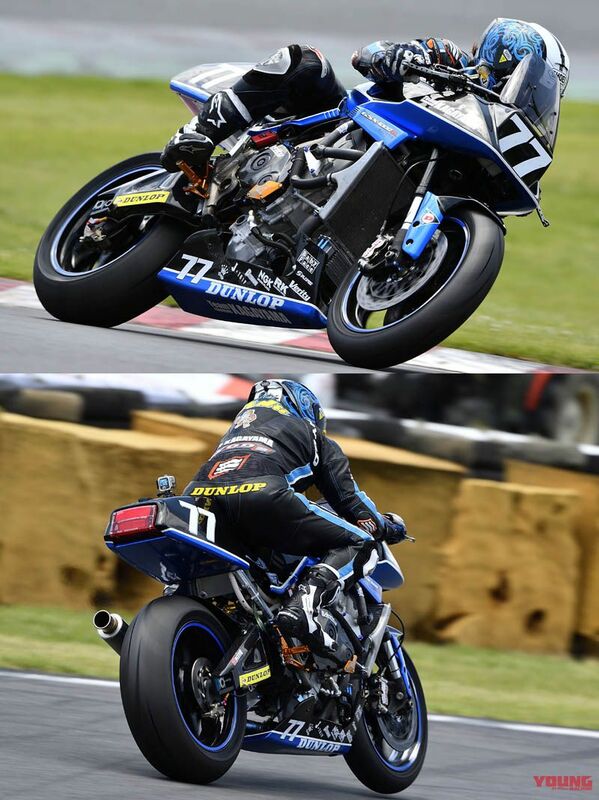 (Team Kagayama Katana 1000R 2018 Taste of Tsukuba Satsuki Stage spec) The other name for this machine for official entry is Katana 1000R, and the name shown on the fairing is GSX-1000R Katana. For a while Yukio Kagayama contended as a top rider in overseas superbike championships as a Suzuki Works rider. Incidentally, there is a connection with HYOD (motorcycle products company) who have co-ordinated the Katana to have a neo-classic look, and the area of synthetic fibres has been designed not to stand out. The pointed upper fairing that is based on the motif of a Japanese sword (Katana “刀” means sword in Japanese) is very well known. The original style Katana doesn’t feel out of place being a racer, what with its smallish screen and separate handles. The reason why it has been equipped with a light on the rear fairing is because it functions as a rear fog light. It appears from the shape that it is a Katana use lens. Since 2011, Team Kagayama and Yukio Kagayama have been competing in the All Japan Road Race Championship with the GSX-R1000. From last year the machine got a full model change to the current L7 lineage, so it appears the L5 lineage engine became a leftover. By chance there was also a Katana frame kicking about, and this is what led to the competing in Taste. The engine and wiring are able to make full use of what came with the existing racer, so the development of the bike didn’t take so long as the team could just concentrate on sorting the bodywork. The bike kicks out 185bhp as standard, but it seems as though it would produce more power with a computer plugged in to tweak the race settings. This is a top power machine for Taste even without massive modding. It also has electrics that can deal with traction control, but it seems that lately Yukio Kagayama has preferred not to make use of this electric device. Three-axis layout modern day litre supersports engines are mainly compact in length from front to rear. Therefore, it is natural that they are too compact for a frame from the generation of the Katana, so the form is a diamond type and the pivot area also gets an exclusive design. It doesn’t use an air-box, so the fuel tank is situated inside the cover. The lower areas include a CBR unit pro-link and Ohlins suspension, and it is configured using a combination of parts such as Gale Speed components. Team Kagayama owner and rider, Yukio Kagayama. In 2011 he started up his own team and made a return to the All Japan Road Race Championship. He is widely known to produce a stir in the racing world, and in a surprise plan at the 2013 Suzuka 8hr endurance race he made an appearance as a rider for Kevin Schwantz, which stays very much fresh in our memory. His involvement in the Taste & Championship are another of his ventures. In the 2018 February edition (released 2017, December 24th) we revealed a new Katana as a scoop in the first of the year’s wish list. Also, at the Milan show in October 2017 plans were revealed by a European magazine about production of a Katana 3.0 based on the GSX-S1000, and since then demand for a revival has been huge worldwide. 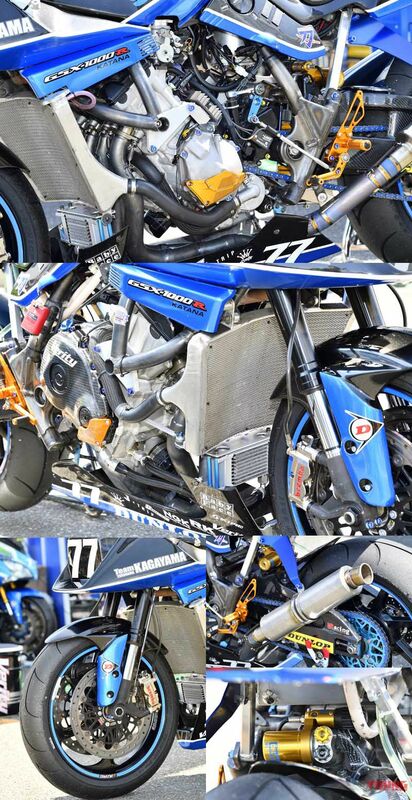 Here at Young Machine we haven’t based the Katana on the GSX-S1000, but as expected we decided to base it on the GSX-R! So, we have produced our own CG, but it is a wholly unexpected design in comparison with the real GSX-R1000 engine Katana racer that Yukio Kagayama has put great efforts into making. It has been 36 years since the appearance of the Katana, yet it is still loved by many riders. So, this CG has been produced in response to the way we believe those riders would want to see a new Katana look. There is hope of further activity next time round! 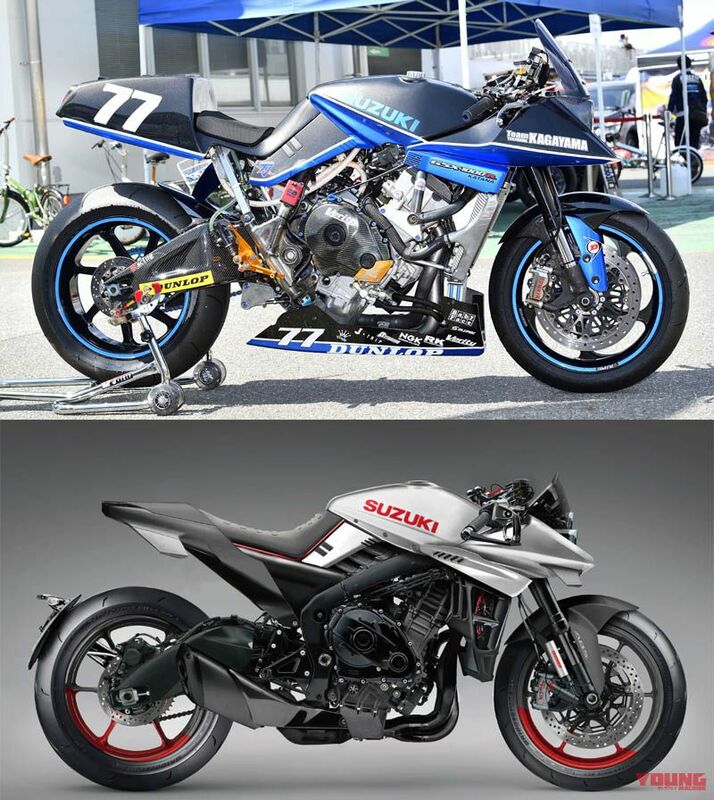 Photo above is the Team Kagayama produced machine, and the lower picture is the GSX-R Katana CG image produced by us here at Young Machine. As expected for the Katana that is proud to have once been the world’s fastest machine, it really suits having cutting-edge mechanisms. (Scoop) Revival of out of production Serow 250, with LED tail lights?! Will the Suzuki Recursion be reverse crank? !